2018 marks the 20th Anniversary of 13th Street Winery. Since 1998 the winery has been producing VQA wines that reflect the unique terroir of Niagara with a particular focus on old vines Gamay Noir, Chardonnay, Riesling and traditional method sparkling wines. Set amongst 25 acres of estate vineyards, 13th Street Winery is located halfway between Jordan and St. Catharines, on Fourth Avenue, just minutes off the QEW. Winemaker Jean-Pierre Colas brings over 30 years of experience including a rich heritage of wine growing in his native Chablis, France. Owners Doug and Karen Whitty bring with them a family history of over 110 years of farming in Niagara. In 2017 Doug was named Grape King by the Grape Growers of Ontario. In 2016 13th Street opened a new contemporary Tasting Room & Wine Bar with an expansive tasting bar to serve guests and floor to ceiling windows on two sides. The expansive grounds are home to a diverse sculpture collection and guests are encouraged to explore the gardens and vineyards. Tastings are available during regular business hours in the wine boutique and seasonal patio fare is offered during the summer months. Also onsite is a local favourite - 13th Street Bakery which features fresh baked goods and an assortment of jams, jellies and preserves all made with Niagara produce plus a large selection of artisanal Ontario cheeses, gourmet food items and unique gifts. House and Home magazine named their butter tarts “Best in Canada” in its July 2017 edition. Before arriving at 13th Street, Jean Pierre was winemaker at Peninsula Ridge Estate Winery in Beamsville for 9 years and previously in his home country of France, worked at the notable Chablis house, Domaine Laroche, where he oversaw production for a period of 10 years. Jean Pierre's winemaking philosophy is quite simple: he believes that great wines come from the best grapes grown in the best vineyards and winemaking techniques are only utilized to capture the very essence of the grapes provenance and character. Simply assuming that estate fruit will be the best year after year may be short-sighted, so Jean Pierre is more than willing to go in search of the very best fruit grown in Niagara each and every vintage to complement that which we grow ourselves in our 40 acres of vineyards. An accomplished producer of world class Chardonnay, Sauvignon Blanc, Gewurztraminer, Gamay, Syrah and traditional method sparkling, Jean Pierre is proving that no matter the variety, if the quality of the fruit is exceptional at harvest, the resulting wines will be equally exceptional. 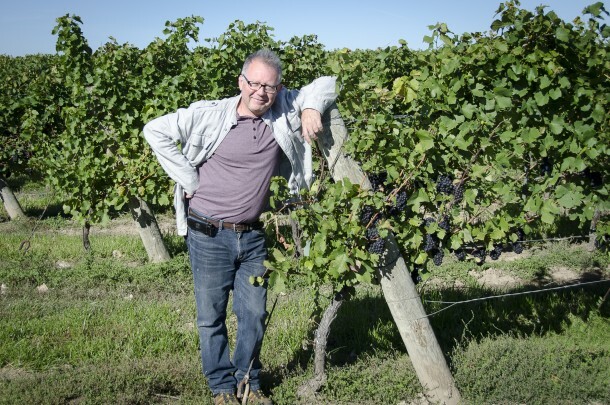 Thus, Jean Pierre plays a key role in overseeing the choices and techniques employed in our 40 acres of estate vineyards and those utilized by the many excellent growers with which he works in the Niagara region. Situated at 43 degrees north, our vineyards are at the northern extreme of viable viticulture so are inherently “cool.” Add to this our winemaker’s core philosophy of maximizing the impression of this terroir through minimal intervention in the winery, our Chardonnays are distinctly “cool” both in style and origin! June's Vineyard is located on 5th Avenue in west St. Catharines. It is based on clay loam soils with decomposed yellow limestone from the shores of the ancient Lake Iroquois, which covered this entire area many millennia ago. The vineyard has good prevailing wind exposure off Lake Ontario for humidity and frost control. Planted in 1999, there are 2.8 acres of Chardonnay (Burgundy Clone 96 on rootstock 3309) which is used in our June’s Vineyard Chardonnay. The vineyard is owned and farmed by our Neighbour Lado Viscek and was planted in the early 1990s. It is located a few kilometers from 13th Street Winery and shares many of the same micro-climatic influences as our June’s Vineyard: the moderating effect of Lake Ontario, the breezes protecting against both excess humidity and frost and the same generally “cool” disposition. Soils are also similar but instead of a mix of yellow limestone and clay loam, L. Viscek is composed of pure clay loam, and the clay is a bit lighter than that found at June’s Vineyard.